Pogo looks forward to his walks every day and on this particular day it was just TOO cold to take my little guy out. We live in upstate NY and it has been particularly cold and snowy this December! So poor Pogo decided to take his toy and sit and watch out the front window for anyone who might be walking or driving by....in the hopes that he might get to go outside - just like a little kid. Maybe tomorrow Pogo!! How cute. Merry Christmas & Happy New Years. Pogo just got weighed at 14.5 lbs. 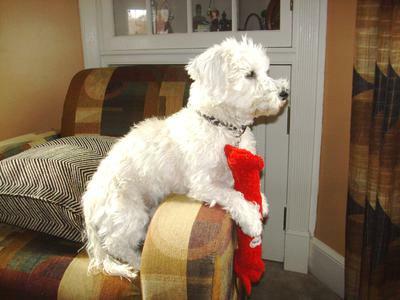 They still call him a bichon mix at our vet - they had never heard of a Coton! We got him at a local shelter and I do not have any proof of his breed. But he really fits what a Coton looks and acts like. 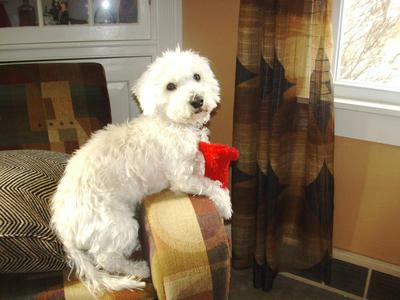 He does not act like a bichon and is "thicker" and a bit stockier in the chest and haunches. Also his legs are shorter. He's built (and acts) more like a terrier. He does have more "whispy", silky hair than cottony, so he could be part Havanese. He's got the off-white hair that looks white until you get him near something REALLY white. He also has tiny black guard hairs sprinkled throughout. He seems to actually change color a bit through the year. This is something I had heard about Cotons. He's really an anomoly! I got a lot of warm coats and stuff from Baxter Boo online.they have excellent customer service. I was able take Tuffy out in the cold snowy weather of Connecticut. We have now moved to California and it's a bit chilly this week, but no where near freezing weather we had back east. It usually warms back up by noon here and cools down at night. He's adorable and big. How much does he weigh? My guy just hit 12lbs but he doesn't seem as long as yours. The wind was crazy today so we couldn't let Apollo out either but he still uses pee wee pads! do you happen to know anyone who is selling cottons? My sister is thinking of getting one and I told her how wonderful they are. Well hope your dog gets out tomorrow! !keep sharing pictures! !